Camp Placid Pines is opened. 1962: Nelson Hammond is born. Nelson Hammond (7) first joins Camp Placid Pines as a camper. Henry is the Camp Director. Bill Anderson, Kevin Thompson, Tom McConnell, and Becky Chambers are a few of the counselors that year. Clayton Moorehouse (30) is made camp director. He's so mean kids call him the "The Serge." Nelson Hammond (12) is rushed to the hospital after nearly drowning during a game of Bloody Murder at Camp Placid Pines with the camp counselors. Trevor Moorhouse (13, son of super-mean camp director Clayton Moorehouse) is almost killed after counselors set up a trap for him in revenge for his constant ratting on them. Clayton vows revenge and steps downs as camp director. Trevor takes to wearing a mask to cover his hideous scars (including a missing upper lip). Bill Anderson is found killed with a chainsaw out in the woods after going for gas. Nelson Hammond (19) is committed to Carpenter County Mental Institution after being convicted of killing his old camp counselor, Bill Anderson. Bill's wife Patricia Zemke is left pregnant and widowed. Nelson Hammond (32) kills the director at Camp Placid Pines and takes his place with no-one else any the wiser. Soon enough, Nelson/Patrick is killing counselors dressed in a cheap hockey mask and boiler suit, the way he imagines Trevor Moorehouse would dress. During his killing spree, three counselors are murdered by him (Whitney Chambers, Brad Thompson, and Dean). A fourth, Doug, is killed by Trevor Moorehouse (29). Soon enough Nelson/Patrick is stopped by camp counselors Julie McConnell and Drew Zemke. Sheriff Williams takes him in. 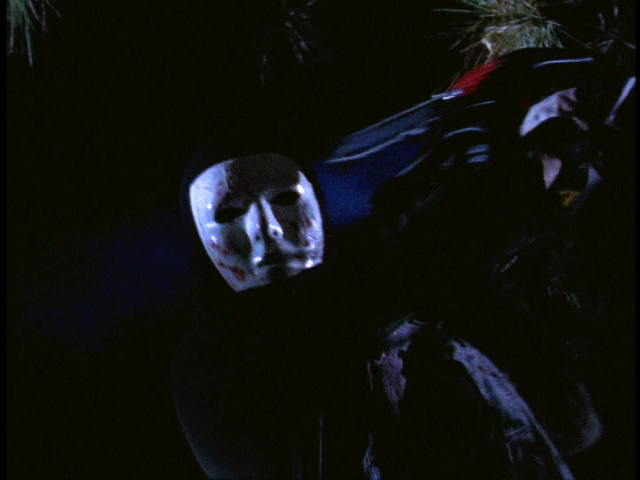 Shortly after everyone leaves, counselor Jason Hathaway is murdered by Clayton Moorehouse dressed in the same cheap hockey mask and boiler suit -- but also wearing a black neck-brace, the same as the person (apparently Nelson Hammond) who killed Bill Anderson in 1980. Clayton Moorehouse (55) leaves town and trains in law enforcement. After 3 years, Clayton Moorehouse (58) returns home with his name changed to Miles Miller. He murders Sheriff Williams in his sleep and becomes the new Sheriff. Tracy Hathaway (sister of Jason) comes to Camp Placid Pines to be a counselor and try to come to terms with her brother's disappearance from the camp 5-years previous. Soon enough, the REAL Trevor Moorehouse (34) shows up and starts killing the counselors. First to go are James and Ryan. After Ryan's body is found, the police are called in. Seeing Trevor is back and killing people, Sherriff Miller (Trevor's Father) kills Elvis and tries to pin it on Tracy's boyfriend Mike, and he is arrested. However, soon enough it is discovered that Mike couldn't have killed Ryan and he is released. Soon enough, Trevor kills Angela and Sherriff Miller kills Mike and Camp Director Rick. Becoming annoyed, Sheriff Miller reveals to Tracy that he killed her bother and boyfriend. Tracy is saved by Sofie and after a fight for survival, both are saved when by change, Trevor turns up and kills his father by chainsaw to the neck cutting off his head. Trevor leaves the girls and drags his Fathers body off into the woods. After escaping death, Tracy's story makes National headlines and Trevor's name becomes household. Any questions? Get them answered here.